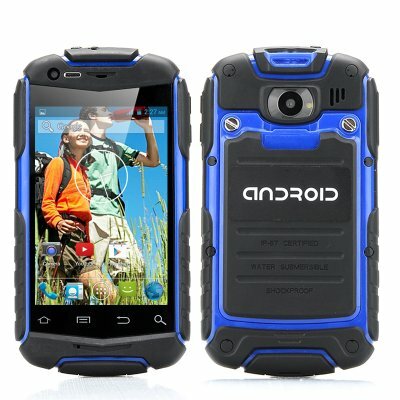 Successfully Added 3.5 Inch Shockproof Phone 'Kratos' - MTK6572W Dual Core, Dual 3G SIM Slots, 32GB SD Card Support, Android 4.2 OS (Blue) to your Shopping Cart. This 3.5 Inch screen dual core Android smart phone has dual 3G SIM card support and can withstand a knock or two with its tough rubberized exterior and shockproof casing that keeps it protected and safe from the hardships of an active outdoor life. This rugged Android smart phone was named after the Greek God of strength and might, Kratos. It has a 3.5 inch capacitive touch screen and is enclosed in a tough rubber case so the 'Kratos' cell phone is sturdy enough to endure some serious abuse which would most likely be the undoing of lesser phones. This hardiness makes it a top choice for anyone who works or spends lots of time outdoors. Kratos and his siblings are known in mythology as the Zeus’ winged enforcers, they stood together in attendance at his heavenly Kingdom and much like this hard-hitting phone, nothing could stand in Kratos way. Using the Android 4.2 framework allows for a large amount of customization of the screen layout and because it has Google Play preinstalled your ready to start selecting from a massive scope of apps to download. The MTK6572W dual core processor will keep this phone running smoothly and the micro SD card slot provides options for adding up to 32 GB of memory so you will have plenty of room for storing your media and apps. With two 3G SIM card slots you can get great bandwidth coverage and this Kratos cell phone gives you the option of using Wi-Fi or one of the 3G SIM slots to get connect to the internet. This will make browsing the net and download apps or media fast and easy. Because the Kratos smart phone has dual SIM support you can organize your busy and hectic life by storing personal and business contacts separately on one device so now there is no reason to keep separate phones for you work and personal life. The front and rear facing cameras let you the take photos and videos so you can make upload your latest adventure pics or selfies and even enjoy video calls with work or friends and family.